Synaptics is popular for producing quality human interface products including TouchPads and ClickPads for notebooks. Newer TouchPads are equipped with multiple gestures like single or multi-finger scrolling, multi-finger tapping, flick and rotation, adjusting sensitivity and speed, momentum, edge motion and many more. Synaptics also develops drivers and software for its TouchPads and ClickPads to customize gestures according to your need. All the features turned on by default can make the TouchPad bulky and difficult to use as minor wrong gesture input may open or close the unwanted pages, mess up your work or take you to somewhere you did not want to be in the first place. Turning Synpatics TouchPad or ClickPad features ON and OFF is quite easy. You just need to go to the properties (settings) of these and make adjustments to best suite your needs. For reference, we are providing solution for Synaptics ToucPad and Synaptics ClickPad installed in HP, Samsung, Dell, Acer, ASUS and Lenovo notebooks. Note that some features could be different or missing depending upon the make and model of your notebook. – Go to the Control Panel of your PC. You will find Synaptics Touchpad button there. 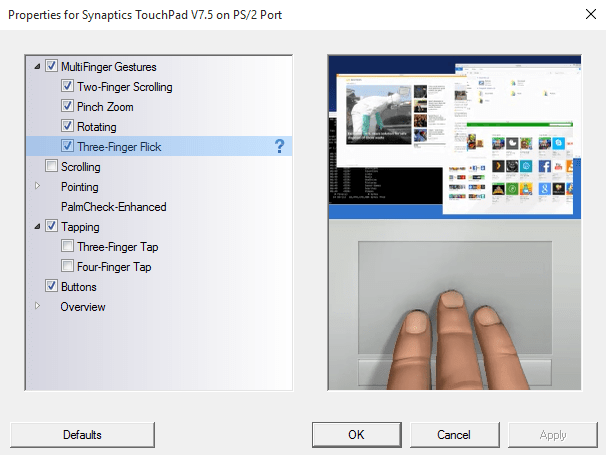 Click that to open the properties (settings menu) of Synaptics TouchPad. – Other way to access Synaptics TouchPad settings is: Control Panel > Mouse > Synaptics TouchPad > Settings. Now make adjustments as needed. Synaptics also provides visual details for each gesture to help you understand how specific gesture works. – Go to the Control Panel > Synatpics ClickPad. Now you can make adjustments as needed. – Other way to access ClickPad settings is: Control Panel > Mouse > Synaptics Clicpad > Settings. If you are using Windows 10, Windows 8.1 or Windows 8, accessing Windows Control Panel might be trickier for you. So you can simply search that with Windows dedicated search feature or you can access that from Start > Windows System > Control Panel. In case of Windows 7, accessing Windows Control Panel is easier. Just go to Start > Control Panel and you can access all the control panel features right away. 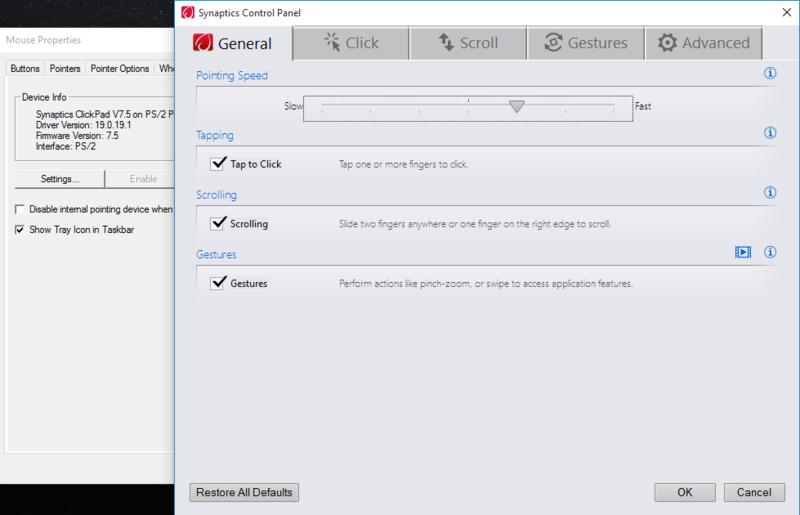 Note that some gestures like Two Finger Tapping can not be disabled from Synaptics properties as no such options are provided (v19.x.x and previous versions). We will make a separate post about how to disable two finger tapping in Windows 10 and previous OS versions.